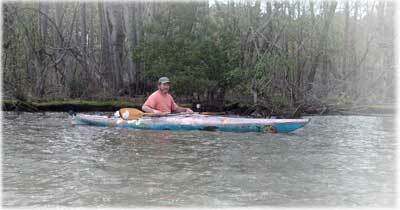 Way back in 1994, Jim Malo bought his first kayak. A 15' touring kayak made by Wilderness Systems. A big, heavy, and slow kayak but so much fun. But through the years, there have been countless times that the desire to paddle somewhere was cancelled due to the burdens of getting there. A vehicle to carry the boat was usually the culprit (new ride with without a rack). But also, the kayak just couldn't be stowed in an apartment. And too, inconviencing others just wasn't an option for those one-way kayaking adventures. Jim has experienced these hassles first hand for 20 years. In the Spring of 2010, only days after the announcement of the whitewater restoration project, Jim was on a solo paddling trip from Columbus to Eufaula. It was a long trip with plenty of time to think and reflect on happenings. He began to think about the whitewater rapids, the gear he would have to buy and the new skills he would have to learn. And with a little more thinking, it didn't take long to decide he needed to be in the kayaking business. First and foremost, his business plan was to help kayakers overcome these hassles he had faced in the past. If successful, those who already have a kayak would visit the river more frequently. And it would turn potential kayakers into actual kayakers. So he began to plan and prep for the business. 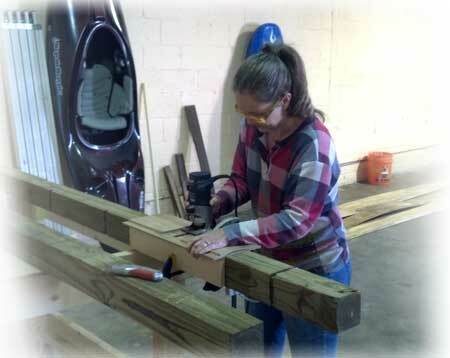 Finally, in December of 2013, he and his wife Lynda made the leap and acquired a building. Many renovations were needed and in May of 2014, the building was suitable enough to provide the needed services for a relaxed kayaking atmosphere. But there is still a lot of work remaining in the future.